India Meets received just one performance, which is a shame because it offered a truly fascinating and diverse experience of Indian and Indian-inspired dance. And it was a sold-out performance. The evening was the brainchild of Liz Lea, who took the opportunity to put the show together to bring to a close a visit to Australia by British Indian dancer, Seeta Patel. Patel’s training is in the Bharata Natyam technique, a style which Lea has also studied and has performed throughout her career, so the focus of the evening was strongly on this style of movement. The live component of the show, for example, began with a solo, Ashtapadi No. 19, beautifully performed by Canberra-based exponent of Bharata Natyam, Jenni White, who danced to a mesmerising voice and percussion accompaniment by Mahesh Radhakrishnan. For those in Canberra, however, who remember Kuchipudi dancer Padma Menon whose work was an integral part of the Canberra dance scene in the 1990s, it was a more than pleasurable experience to see Shivashtakam, performed by local Kuchipudi dancers Vanaja Dasika and Suhasini Sumithra. Their exuberant performance was a delight and offered insight into another South Indian technique. Lea herself performed two pieces. 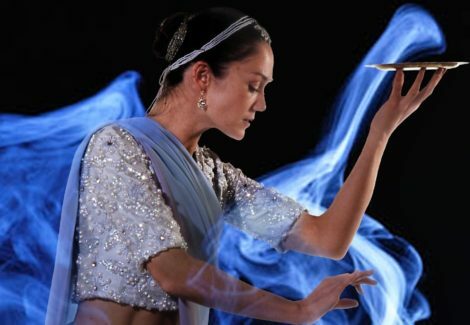 The first, The Incense, was based on a 1906 work by American dancer Ruth St Denis whose interest in spirituality led her to look to India for inspiration to nurture her choreographic and performance career. 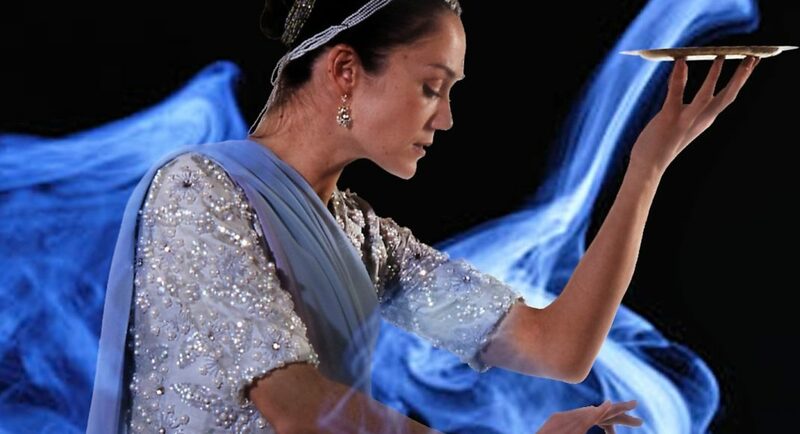 In The Incense the dancer enacts an incense burning ritual and Lea’s reinterpretation was strongly performed. She held the attention with some fine lyrical movement and arresting poses. The second of Lea’s solos, When Tagore met Einstein, was based on a discussion that took place between poet Rabindranath Tagore and scientist Albert Einstein in 1930. This work perhaps needs to be seen more than once for its full value to be realised. It was hard to follow the extraordinary complexities of the conversation, which was used as a voice-over, and at the same time to focus on the choreography and its performance. Both pieces represented Lea’s interest in historical conjunctions between the cultures of East and West and also demonstrated, in particular with When Tagore met Einstein, her interest in using classical techniques in a contemporary manner. Patel showed two solos. Patra Pravesham—Ananda Nartana Ganapatim, which concerned the elephant-headed god Ganesha, and which included a strong display of some of the technical aspects of Bharata Natyam; and Padam (Theruvil Vaaraano)—Raga Kamas, showing the expressionistic side of the style. Patel has a powerful sense of focus, meticulous attention to detail, and is an extraordinarily articulate dancer in the manner in which she moves through the choreography and the complex expressionistic language. Only the very best dancers, in whatever dance style they might espouse, have the ability to make their movement look as though it is completely at one with the body. Patel has it all and her performance was moving and utterly entrancing. She is an extraordinary dance artist. Two short (very short) films were also part of the program. Both gave insight into Patel’s process and practice with one focusing on the work in which she has been engaged in Australia with contemporary choreographer Lina Limosani. For more on Patel’s Australian visit, including a link to the Limosani collaboration, see this link.